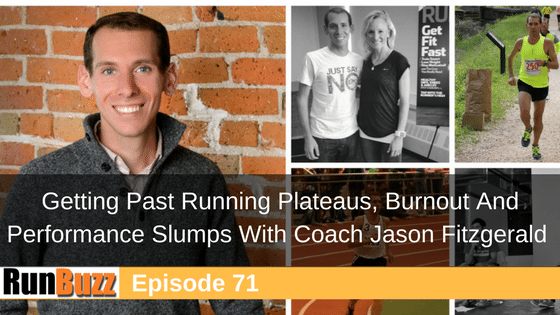 In this episode, we talk to Coach Jason Fitzgerald about running plateaus, running slumps, and what to do when we stall with our running. We also talk about the differences between burnout and performance plateaus. Jason hosts the Strength Running Podcast and runs the Strength Running website. Jason provides a ton of running tips to help break through any running slumps to get you back on track with your progress. I also introduce our next LIVE Summer Series workshop (a replay will be available) where we dig into the fact vs. fiction of running for weight loss and how training and nutrition plays into your running. We’ll look into what the science says and I’ll share some tools you can use to start your weight loss journey whether you just need to lose a few pounds or a lot. Is there really such thing as a reaching a running plateau? What does a running plateau mean within the scope of today’s discussion? The physiology of reaching your physical limits of running is extremely rare, even in elite athletes. Most of us never reach their potential. The importance of mindset, patience, and focusing on the next logical step in your training. The importance of making a break-thru in your training, and its correlation to improved racing. The importance of finding the type of training that best works with the type of runner you are. Some runners respond well to high volume and some don’t. Some respond well to high intensity/speed work, some runners fall apart. How do we know what kind of runner we are? Burnout is more mental fatigue whereas over training is more physiological. The importance of cycling your training to prevent burnout. Can racing too much impact our ability to progress? What are the tradeoff’s? How can we integrate multiple races into a training season? The #1 limiting factor for most runners is endurance. To get faster, your endurance fitness level must be improved. For 5k-10k distances, the long run is the second most important workout of the week. For half and full marathon distances, the long run is the most important workout each week. How to ‘sandwich’ your run to improve your running. How to ‘progress’ your run from where you are at to get to your next logical position in your training. The importance of experience, ongoing education and active learning as a runner.